One in five people in Scotland are living in relative poverty. Latest government figures covering the last three years show that 1.03 million people are existing below the poverty threshold. The figures reveal that 240,000 children are living in poverty, two thirds of those coming from working households. The data is based on income and shows a continuing trend of rising poverty and income inequality. They show a 1% rise of 30,000 people in the country living in relative poverty in the three-year period up to 2018. Campaigners have called on the UK government to end the benefits freeze and for Holyrood to implement it's "income supplement" much sooner than the proposed date of 2022. But the Scottish government said it was fighting poverty with "one hand tied behind its back" as it tried to mitigate Westminster cuts. Relative poverty is classed as an income which is below 60% of what is recognised as the middle income. John Dickie, director of the Child Poverty Action Group (CPAG) in Scotland, said that struggling families could not wait years for the introduction of the Scottish government's promised income supplement. He believes a £5 top-up to child benefit would be one simple way of lifting thousands of children out of poverty. Mr Dickie said: "As time slips by, childhoods slip by, childhoods blighted by the simple fact their families just don't have the money they need to give their children a decent start in life. "These aren't just statistics. These are children going hungry, missing out on school trips, unable to enjoy the activities and opportunities their better-off peers take for granted. These are parents going without meals, juggling debt and seeing their own health suffer to protect their children from the poverty they face". Douglas Hamilton, of the Poverty and Inequality Commission, said it was time for "meaningful action". He said: "Poverty has a firm grip on Scotland. Behind these statistics, there is the reality that over one million people are locked in a daily struggle to make ends meet. "If the Scottish government is serious about addressing this, it should be making full use of their powers to reduce housing costs, improve earnings and enhance social security. " Jamie Livingstone, head of Oxfam Scotland, said: "It's deeply troubling that the gap between the richest and poorest people in Scotland is continuing to grow. 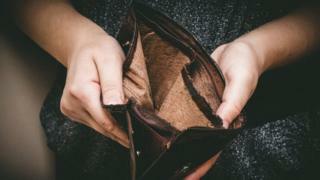 "If this widening income inequality is left unchecked then it will continue to undermine efforts to tackle rising levels of poverty as these challenges are interconnected. "The Scottish Parliament must do everything in its power to turn its tough talk on tackling inequality into concrete action if it's going to make meaningful progress in creating the fairer, more equal Scotland we all want to live in." Communities Secretary Aileen Campbell said she was disappointed in the figures but added that the Scottish government remained determined to reduce poverty in Scotland. But she said they did so with "one hand tied behind our back" as cuts were set to reduce the UK government social security spend in Scotland by £3.7bn by 2020-21. She said: "A key driver in rising poverty is the devastating impact of the UK government's welfare cuts and benefits freeze - policies we have consistently called for an end to. "We invested over £125m in 2018/19 to mitigate the worst of these cuts, however I would rather we were able to use these funds to pull people out of poverty rather than protect against the impacts of another government's policies. "We remain determined to tackle and reduce poverty in Scotland and have shown this through the bold decisions we have made on income tax, affordable housing provision, early learning and childcare and in ambitious action to end child poverty. "